Mathesius, S., M. Hofmann, K. Caldeira, and H. J. Schellnhuber, 2015: Long-term response of oceans to CO2 removal from the atmosphere. Nature Clim. Change, doi:10.1038/nclimate2729. Carbon dioxide removal (CDR) from the atmosphere has been proposed as a measure for mitigating global warming and ocean acidification. To assess the extent to which CDR might eliminate the long-term consequences of anthropogenic CO2 emissions in the marine environment, we simulate the effect of two massive CDR interventions with CO2 extraction rates of 5 GtC yr−1and 25 GtC yr−1, respectively, while CO2 emissions follow the extended RCP8.5 pathway. We falsify two hypotheses: the first being that CDR can restore pre-industrial conditions in the ocean by reducing the atmospheric CO2 concentration back to its pre-industrial level, and the second being that high CO2 emissions rates (RCP8.5) followed by CDR have long-term oceanic consequences that are similar to those of low emissions rates (RCP2.6). Focusing on pH, temperature and dissolved oxygen, we find that even after several centuries of CDR deployment, past CO2emissions would leave a substantial legacy in the marine environment. Figure 1. Globally averaged atmospheric variables. 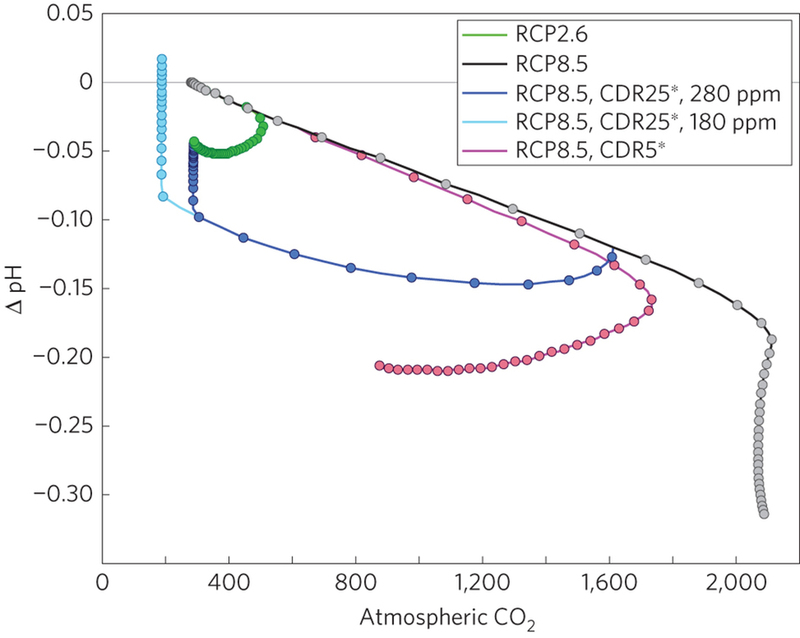 Trajectories for RCP8.5 (black), CDR5 (red), CDR25 (orange), CDR5* (purple), CDR25* (blue) and RCP2.6 (green). See main text for further details. a, Net CO2emissions, defined as the CO2 emissions minus the amount of CO2 that is extracted. In the CDR25 scenario, the CO2 concentration returns to 280 ppm shortly before 2500 (year 2494, vertical green line) and is held constant from then on, therefore no net emissions are presented for the remaining period. b, Atmospheric concentration of CO2. c, Anomalies of atmospheric surface temperature, with respect to year 1800. Figure 4. Globally averaged pH anomalies as a function of atmospheric CO2 concentration. Illustrated are the trajectories for RCP2.6 (green), RCP8.5 (black), CDR5* (purple) and CDR25* with CO2 removal until the pre-industrial level of 280 ppm is restored (dark blue), and CDR25* with CO2 removal until the glacial level of 180 ppm is reached (light blue), respectively. In both CDR25* scenarios CDR starts in 2150, while in CDR5* it begins already in 2050. Dots mark intervals of 20 years, indicating the rate of changes. All anomalies were calculated with respect to year 1800.